With binoculars by SWAROVSKI OPTIK every moment becomes an experience. Our technology lets you conquer previous boundaries and opens up completely new dimensions in observation. We set the highest standards for optic and design in all our binoculars to provide you with breath-taking moments of diamond-bright appearance and perfect focus. You will most certainly find the perfect partner for your special requirements within our product range. With their reliable, high-quality optical system and rugged construction, the SLC binoculars are among the world’s most popular high-end binoculars. The thumb rests on the underside and the depressions on the top side of the easy to handle rubber armoring ensure secure and comfortable handling. The diversity of models among the SLC binoculars offers the right solution for every purpose. In the SLC series, Swarovski Optik uses high-quality technologies such as the SWAROBRIGHT coating for maximum color fidelity across the whole light spectrum or the SWAROTOP and SWARODUR coatings for bright, high-contrast images. Fluoride-containing HD lenses minimize the color fringing that is unavoidable with conventional types of glass. As a result, the new SLC 42 HD provides high contrast images in natural colors with razor-sharp outlines: exceptionally high quality crystal-clear images that brings you even closer to the true beauty and fascinating details to be found in nature. Thanks to its short, slender construction, the new SLC 42 HD fits even better in your hand. And the new magnesium housing makes it significantly lighter than its predecessor – ideal for fatigue-free and precise observation, even when wearing gloves. 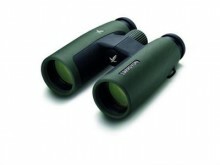 Click the button below to add the Swarovski 10x42 B HD SLC Binoculars to your wish list.